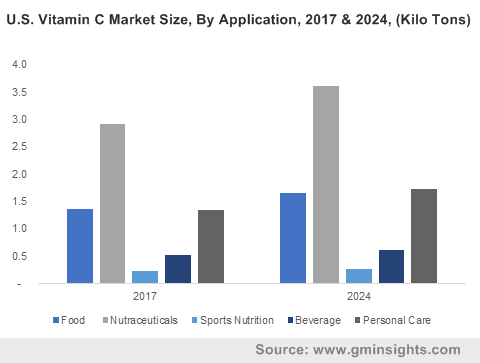 Vitamin Ingredients Market for Food & Personal Care Applications was over USD 2 billion in 2017 and industry expects consumption above 145 kilo tons by 2024. Growing healthcare awareness, rise in elderly population, and surging healthcare costs may contribute to vitamin ingredients market size for food & personal care applications. These nutrients cure various diseases depending on the benefits they offer. Shortage of these nutrients owing to poor diet in children may cause hypocalcemia, rickets, restricted muscle development and movement ability. In 2017, over 12 million children suffered from chronic malnutrition in China which indicates ample growth potential for vitamin ingredients market for food & personal care applications. Increasing consumption of junk food on account of changing lifestyles has led to rising deficiency of essential vitamin products such as A, B1, B2, K and E. In 2017, as per WHO, over 9.5 million pregnant women suffer from night blindness globally. Growing awareness of adverse health effects of deficiency such as night blindness & infertility caused by insufficient vitamin A supply and nausea & blurry vision by thiamine deficiency may accelerate growth of vitamin market for food & personal care applications. Growing consumer awareness regarding healthy diet consumption has led to rise in dietary supplement market demand. Japan nutraceutical market accounted for over 30% of the total market share in 2017. Whereas, China nutraceutical market accounted for about 10% of the total demand owing to rising consumer awareness regarding healthy diet intake along with buyer’s purchasing power. Increasing consumer consciousness towards weight loss and calorie reduction mainly in China, India, Japan, and Australia should drive industry growth over the forecast timeframe. Lack of awareness regarding dosage of dietary supplements along with possible toxic side-effects from overconsumption may restrain vitamin ingredients market for food & personal care applications. However, recent establishment of stringent labelling regulations such as the U.S. Dietary Supplements Health and Education Act (DSHEA) which empowers the FDA to check product health claims & hazards and other EU Directive which restricts the number & types of vitamins allowed for supplement manufacture could boost the global market for food & personal care applications. Vitamin A market size for food applications was valued over USD 180 million in 2017. Rising incidence of ophthalmic illnesses, increase in the geriatric population, increasing healthcare expenditure and booming food & beverages sector may stimulate industry growth. This product helps in adequate growth & development, lowers cancer risk along with treating eye disorders such as cataract, night blindness & myopia thereby boosting the market for food & personal care applications. Vitamin D market size for personal care applications may witness significant growth rate at around 4% by 2024. Increasing investments, and rising incidence of chronic illnesses may increase product demand. This nutrient helps in optimum calcium absorption for bone health, reduces depression, helps prevent diabetes, hypertension, and vitamin D deficiency which may lead to breast, colon, prostate cancer & bone malformations. Vitamin E market size for food applications may grow significantly at over 3.5% up to 2024. Rising healthcare cost and increasing geriatric population in Japan, the U.S. and Germany is likely to drive the overall market for food & personal care applications. helps in preventing free radicals, balances cholesterol, lower cancer risk, repairs skin and promotes muscle strength. Growing preference for a healthy lifestyle along with increasing healthy diet adoption and dietary supplements may accelerate industry growth. Food applications from vitamin B1 market size was valued at over USD 95 million in 2017. This water-soluble nutrient plays a vital role in muscle, nerve & heart function, glucose metabolism and is used to treat various digestive problems such as diarrhea and poor appetite thus stimulating vitamin ingredients market for food & personal care applications. It is used in the fortification of various consumables such as dietetic products, and baby feed products. Vitamin-B1 has vast application potential in white rice, flour and cereal-based products which may promote growth of vitamin ingredients market for food & personal care applications. Vitamin C market size from beverage applications shall witness average gains at over 2.5% during the predicted timeframe. This nutrient is primarily used in the manufacturing of energy drinks, soft drinks and fruit-juice based beverages which indicates vast growth potential for vitamin ingredients market for food & personal care applications. It improves product appearance and palatability. It reduces oxidative flavor spoilage in soft drinks and reduces oxygen content in canned & bottled beverages which may accelerate growth of vitamin ingredients market for food & personal care applications. North America driven by Canada, Mexico, and the U.S. market for food & personal care applications witnessed a consumption at over 32.5 kilo tons in 2017. Rapidly aging population along with increasing demand for low calorie dietary products for reducing obesity may stimulate industry growth in the region. Favorable policies regarding acceptance of organic personal care products by health & safety regulatory bodies may further stimulate regional market growth. Asia Pacific led by India, Japan, Australia and China market for food & personal care applications may grow significantly at over 4.5% over the forecast period. Increasing nutritional imbalance owing to rising alcohol consumption, smoking and junk food intake with lifestyle change is predicted to increase product demand. This region has witnessed rapid economic growth which has boosted per-capita disposable income thereby allowing consumers to increase spending on functional feed and dietary supplements and stimulating thr market for food & personal care applications. 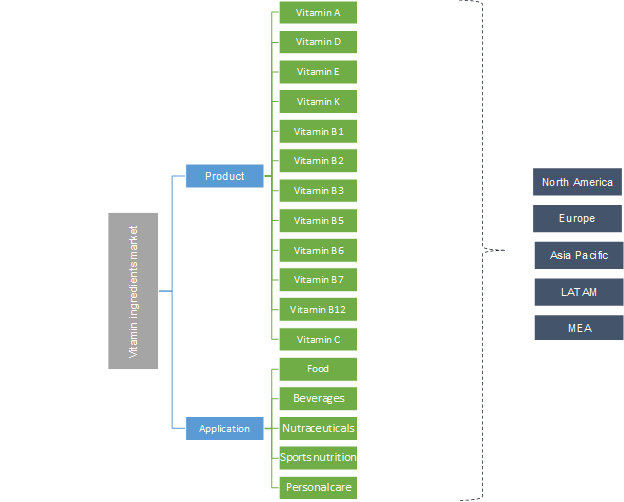 Vitamin ingredients market for food & personal care applications is competitive owing to substantial market consolidation between key industry participants such as Pfizer, BASF, Koninklijke DSM, Nestle, Lonza, and Groupe Danone. Manufacturing companies are focusing on innovative strategies to develop new products and expand their product portfolios. Moreover, prominent manufacturers are focusing on acquisitions to strengthen their market positions in the desired segment and thereby promote growth of the market for food & personal care applications. Vitamins are organic micronutrients which are essential for growth, repair & metabolism of the human body. Most of these nutrients must be supplemented in the human diet as the body is incapable of producing them or cannot produce enough amounts which indicates ample growth potential for vitamin ingredients market for food & personal care applications. These products are primarily used in food & beverage, nutraceuticals, sports nutrition, and personal care industries. Increasing cases of deficiency, economic growth in developing nations, rising consumption of junk food and increase in geriatric population requiring preventive healthcare may stimulate the market for food & personal care applications.